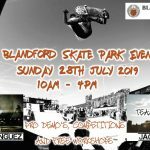 Evesham skatepark is an all concrete skatepark that can be found on the banks of the River Avon and has a fairly simple back and forth layout. The skatepark is made up of a half pipe on one side and next to this is a quarter pipe and a flat bank that open up onto the main body of the skatepark. Following these are a manny pad, jump box and a hubba and after these are a rail and another flat bank for a return ramp. 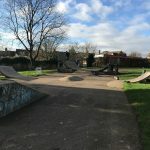 Evesham skatepark is a great little spot, the selection of obstacles isn’t the most original but the surfaces are smooth and fast meaning that it is a good place to come and practise the basics. 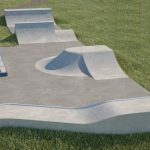 However, if you are more experienced and after a more challenging skate check out some of the other skateparks nearby. Evesham train station: Exit the station onto High Street and head south until the footpath that exits into Abbey Park is on your left. Take this path until the end and Evesham skatepark will be in sight. 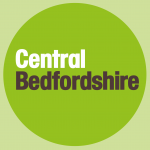 Leisure Centre bus stop: Exit the bus onto Abbey Road and take the road that exits onto Abbey Park and Evesham skatepark will be at the end of this road.